It turns out the Nook Touch and Sony PRS-T1 aren’t the only E Ink ereaders to get hacked to run video games, among other things. Now someone has managed to port Tetris to the Kobo Touch, and it looks like the old school Pong game works as well. Doing so requires rooting the Kobo Touch and installing python and the pygame module—the Kobo runs Linux, not Android like the Sony and Nook. Quite frankly all the Linux talk is over my head, but you can find all the information about this over at MobileRead. 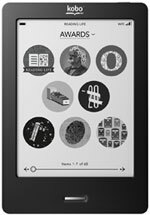 The Kobo Touch is a 6″ E Ink ebook reader. It has a touchscreen, 2GB of memory, a microSD card slot, and supports EPUB, PDF, MOBI, TXT, HTML, RTF, CBR, and CBZ formats. It comes with a few extras like a web browser, Sudoku, and sketch pad, and now for those willing and with a little Linux knowledge some additional features can be added as well.